The opening day of FIBA European championship is always special as all the counters start at zero as preparation games are forgotten. Only six players from the Netherlands attended the opening ceremony as they had injury concerns before the opening match. It appears that everybody has recovered as they rolled over Belarus in the opening game (75-42). France made hard work of beating Italy (60-58) in an entertaining game while the Slovak Republic just came back to win in a low scoring match (39-38). Spain had more or less won the Fiba Europe game midway through the third quarter after guarding Sabine Niedola for the first 20 minutes. They won (67-46). The Netherlands pounded the boards in a sketchy game to beat Belarus comfortably in the opening game in Group C (75-42). After a slow start to the match, a 9-0 burst sparked by Zera Buttter put the Dutch on their way as they edged the first quarter (19-12). The Dutch did the rest with a balanced scoring as Maxime Essenstam led the way with 16 points while Chatilla van Grinsven, Tessel van Dongen and Marlou de Kleijn all finished in double digits with 14, 12 and 10 points each. Both teams did not start the game well and missed a lot of good opportunities to score although Maryia Papova opened the scoring for Belarus. However the Dutch appeared to be in control despite falling further behind due to a trey by Maryia Filonchyk (4-7). The Dutch needed a spark and it came with a rainbow three from Zera Butter. The Netherlands then went on a 9-0 run to take hold of the first quarter against Belarus and led (19-12) at the end of the first quarter. 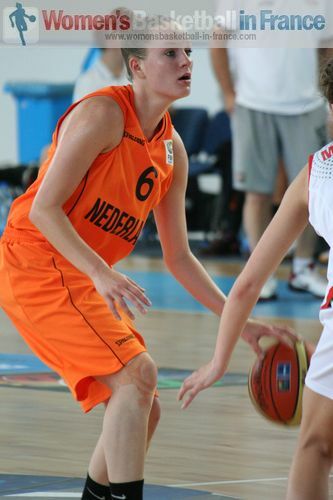 A more balanced second quarter, although with 9 points coming from Tessel van Dongen, the Netherlands went into the locker room leading (36-26). The Dutch stamped their authority on the game at the start of the third quarter with complete control of the boards and 7 unanswered points. 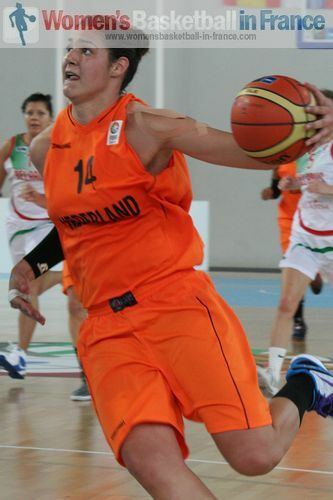 The Netherlands became a little careless allowing Aliaksandra Musatava to end the Belarus barren spell from the free-throw line. All of a sudden Belarus started to get the upper hand. When Papova (right) was allowed to walk through the Dutch force field to score (30-43), the Dutch coach called a time-out with 5:17 to play on the quarter. While Belarus cut down the turnovers, for some reason the Netherlands decided that they needed to double their first-half turnover quota in ten minutes. All the same the Netherlands went into the final quarter in front (51-35) and then blew Belarus apart in the final quarter to win with ease (75-42). 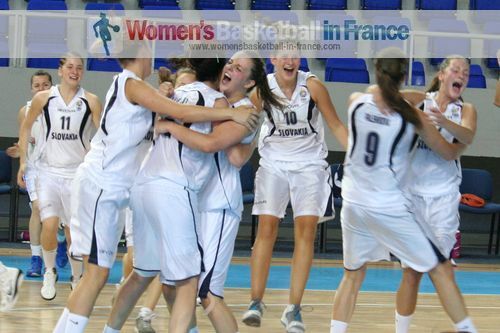 France got their FIBA Europe U20 championship off to a perfect start with a (60-58) victory against Italy. It was not a pretty match with 24 turnovers compared with just 9 for Italy. However what the stats do not show is the intensity the players played with Touty Gandega (left) in no mood to lose the match. Her effort paid off as her team-mates stepped up during the final phase. Kelly Corre and Gandega finished with 14 points each. 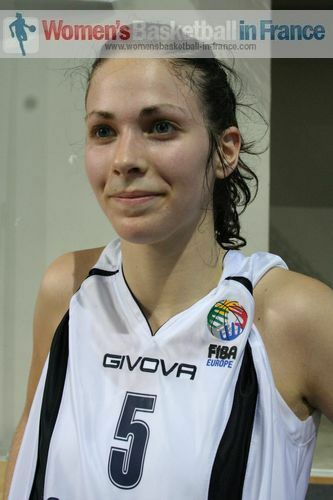 Italy did not turn the ball over as much as France but lost the battle of the boards and a low shooting percentage despite the 19 points from Alessandra Tava. Italy and France got off to a flying start without a round of observation. Federica Tognalini was first on the score sheet for Italy within 60 seconds. However Touty Gandega responded for France with a turn-a-round jump shot in the paint. Italy quickly closed their defense leaving France chasing shadows as they tried to get inside. Italy took full advantage by scoring 3 more points to lead (5-2). France changed tactics. Then it was the turn of the Italians to struggle offensively while Sophie Le Marrec's back to back scores put France in front (6-5) midway through the quarter. The two teams neutralised each other during the rest of the first quarter with solid defending. Yet France gained the upper hand briefly and led by 4 points going into the last minute of the first quarter. But the Italians with Laura Spreafico (right) and Giulia Leva scoring the two teams finished the first quarter tied (14-14). 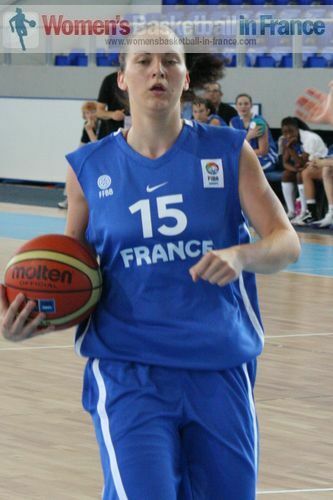 Kelly Corre opened the scoring in the second quarter for France. However the Italians were back almost immediately with back to back scores from Alessandra Tava which prompted Grégory Halin to call a time-out with 8:14 left to play in the second quarter. Italy started to give a master class in the art of defending with Federica Nannucci and Alessandra Tava coming away with big deflections as they once again shut France out. In attack Italy were finding their mark with Leva hitting the trey of the game (23-16). 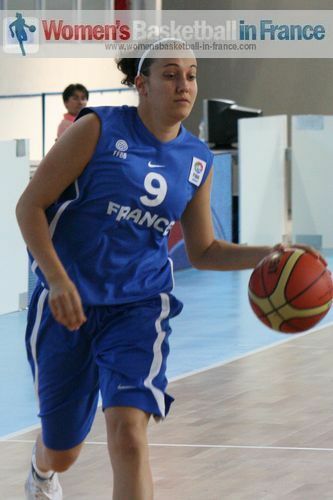 France had to wait for a little magic from Linda Bousbaa who scored with drive to the basket as well as getting the foul for her team's first points in almost five minutes. 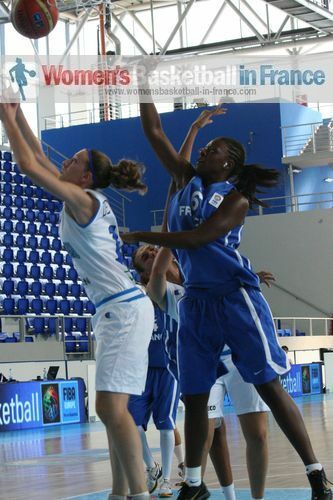 This action sparked Hhadydia Minte into action with back to back scores for France. France trailed by a single point (22-23) with four minutes to play in the first half. The pace went up as both teams more or less traded score for score until France gained the upper hand with Gandega hustling in defense that enabled her to score and also set up Kekelly Ekanga (left) to score on the buzzer (31-27). Italy went on the attack straight from the break and tied the game (31-31) with a pair from the charity stripes by Tava (31-31). The game became more and more physical and unfortunately Spreafico came out second best in a challenge for a rebound. After a little scare she managed to leave the court on her two feet. Meanwhile the two teams continued with their scoring exchange with every score becoming more spectacular. Spreafico returned to action and was to score the last point of the third quarter from the charity stripe after Bousbas was called for an unsportsmanlike foul on her at mid court (43-43). 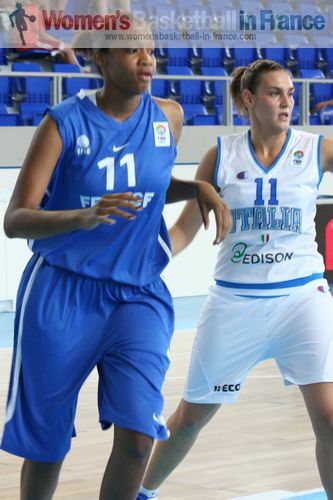 Tayara Madonna got the show on the road for Italy. A three-pointer followed quickly by Federica Nannucci. 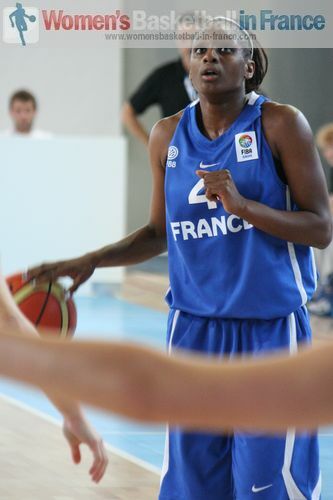 France did not panic and with some aggressive play and the former Paris Basket 18 combination of Hhadydia Minte and Gandega France were back in front (52-51) with 6:47 to play. Gandega had no intention of allowing Italy to have this game and fought tooth and nail for every ball while scoring to give France a 3-point advantage (56-53) with four minutes to play. Italy came back to within 1 point with a minute left to play (55-56). But once again Gandega - playing point guard - held the ball long enough and then created space for Isabelle Strunc to hit a long-distance jumper (58-55) with 30 seconds remaining. The remaining time was played at the free-throw line. Despite Italy calling a time-out with 0.3 seconds left to play France won the match (60-58). The Slovak Republic scored first through Martina Kissová (left) and stayed in front throughout the first quarter. The only three-pointer in the first ten minutes came from Great Britain's Gemma Bullard to make it a 2-point game (10-12). However Kissová was to have the last say with a couple of free throws for the Slovak Republic to edge the first quarter (14-10). The second quarter was a festival in turnovers and missed shots from both teams although the defense was good. The Slovaks used their height advantage for the blocks while Great Britain continued to get the defensive rebounds. The Slovak Republic maintained their advantage going into the interval (24-20). The third quarter finally came to live with 39 seconds to play when Ella Clark tied the game with a 24-second buzzer beater baseline three. The Slovak Republic then stepped up and Angelika Slamová hit the shot to give her side the advantage they needed going into the final quarter (33-31). The final quarter was hyper defensive. With next to nothing on the scoreboard until the last minutes Great Britain edged in front with a trey by Renee Busch. However the Slovak Republic managed to score with Lucua Staneková. Yet the real drama was to come in the last seconds as both sides missed shot after shot. With 14 seconds left to play Great Britain had the ball and just had to play the clock down or get fouled. But the youthful exuberance came into play as Clark had a three-point attempt with seven seconds to play. She missed and Marta Páleníková somehow scored with 2.2 seconds left for the Slovak Republic to win this Fiba Europe match (39-38). Spain were never in any danger in this Fiba Europe match against Latvia. They simply double- and triple-teamed Sabine Niedola for the first 20 minutes. They also had the luck that Dita Rozenberga picked up 4 fouls in less than five minutes of the first quarter. Mireia Vila (left) with 21 points and 3 assists was in a class of her own while Vanessa Blé controlled the paint. She finished with a double-double of 10 points and 12 rebounds. 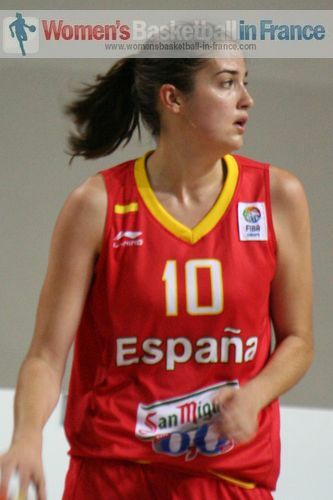 Vega Gimeno was the only other player in double digits with 12 points. Spain scored a lot of points from fast breaks and transition play which made up for a poor shooting day. Niedola finished with her usual double-double with 10 points and 15 rebounds while Liga Surkusa led the team scoring with 10 points. 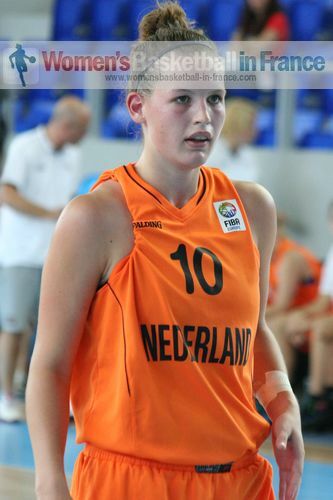 Anete Kirsteine also added 10 points. Spain had the ball for most of the time during the first five minutes. Due to winning rebound after rebound and some defending they only led (7-2) with 4 points coming from Mariona Ortiz and a trey by Mireia Vila. Worse was to come for Latvia with Vanessa Blé dominating everything in the paint. Once she started to score nothing could stop her as Spain went on a 10-0 run. Also bad for Latvia was the foul problems for Dita Rozenberga who picked up 4 in just four minutes. Spain finished the first quarter leading (19-5). Spain relaxed a little too much during the second quarter which resulted in them scoring just 4 points during the last four minutes. Latvia took advantage to score 7 unanswered points midway through the quarter but still went into the locker room trailing by 13 points (20-33). It was a curious second quarter for Spain as they allowed Latvia a 7-0 run before keeping them scoreless for nearly four minutes and stay in the lead (33-20). Spain started the second half slowly and Niedola quickly made use of the free space to reverse spin to score the first points. Latvia were more adventurous and played off a fast break transition that gave Liga Surkusa all the time in the world to score a trey from the top of the arc. This was as good as it got for Latvia because Spain switched to player on player marking and scored 17 straight points to more or less end the game as a contest with 14 minutes remaining (52-25). 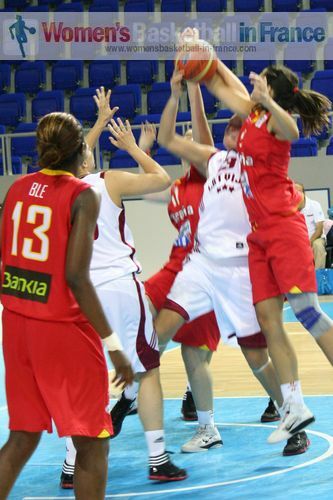 The combination Blé and Vila were unstoppable as Spain went into the final quarter leading (57-31). The last quarter turned into a training match as Spain cruised. However Tanja Perez from Spain slipped badly and had to be carried out of the court by two of her team-mates with 6:45 seconds left to play. Spain continued to press forward and with five seconds left on the game clock Vega Gimeno fired in a 24-second violation buzzer shoot from down-town for the last points of the game (67-46).